Though I'd like to share the progress I've made with booting Leopard on my G4 upgraded Beige G3. These should also apply to G4 upgraded B&W G3s and Yikes G4 towers. The most common problem other people seem to be getting is a 'driver missing for this platform' error at boot. Prior to this I had Tiger running on both a G3 Desktop and G3 AIO. Interestingly, on the 1st revision iMac I gave up trying to install Tiger, as it would always kernel panic. Both of these with the help of XPostFacto. I was initially interested in trying to install Leopard, as I knew from the 2006 WWDC Preview release that G3 support and platform drivers were built in - both of which, as everyone knows, have been removed from the retail version. Used a Digital Audio tower to install a new copy of leopard onto a 7 GB partition. Compared the extensions folder in /System/Library/Extensions/ from a Tiger partition with XPostFacto installed to the new Leopard installation. Manually copied the missing ones from Tiger to Leopard. Booted in OS 9 and used XPostFacto to configure booting from the new Leopard partition and re-install extensions. This then boots as far as just before launching the GUI - just after login window starts - but then a crash occurs. Prior to this booting just hung with a 'driver missing for this platform' error. As far as I can tell the problem lies in the iographics driver extension and is probably traceable to the fact that these machines are PCI-graphics based. This might also explain why the reader report of a G4-upgraded slot loading iMac works, because they were the first model to support AGP graphics. Technically, with a few extension/driver work-arounds, it should be possible to overcome the above problem, as previous versions of XPostFacto have done. Hope this gives inspiration to any G4 Yikes owners or G4-upgraded B&W G3s to give the above method a go and see how far they get. Thanks for writing. I think you're right about the lack of AGP video being the problem. We've had reports of success with the Pismo PowerBook G3 and the Sawtooth Power Mac G4, the oldest Macs with AGP graphics (it took some digging to learn that about Pismo), but nothing older. The best solution might be to find someone who has an older developer version of Leopard and find out if at any point it ran on Macs without AGP video. If so, it shouldn't be hard to extract the drivers and try them on your beige G3. I read with interest and pleasure your article comparing Microsoft Word and Apple Pages for professional writing (in your case, in writing two books). I too would like to adopt Pages as my academic/professional writing tool, but Apple has left several roadblocks in place. Specifically, Apple has not published an application programming interface (API) for Pages, so third party developers have been unable to expand Pages with professional tools. As an academic scientist, I write many manuscripts, grants, and other documents that require references and endnotes. There are several reference managers on the market, notably EndNote, Bookends, and Sente. Each of these interacts with Microsoft Word (all three) or other Mac word processors (Sente and Bookends). However, only Endnote has versions available for both Mac and Windows, which is important for collaboration. Sadly, none of these reference managers can function with Pages, because Apple has not made the APIs available for their interaction. Therefore, academic writers are doomed to using using Microsoft Word (probably Word 2004) until Apple opens up Pages to developers. Most of us don't like it, but there are no other choices. Ironically, even Endnote's support for Microsoft Word might dry up with Office 2008: Endnote uses Microsoft's Visual Basic scripting to embed its reference markers, and Microsoft is eliminating VB from Office 2008. More cheerfully, Pages 3.0 has AppleScript support. Since AppleScript support implies an underlying API, enterprising third-party developers may finally have a way to add reference manager support to Pages. I look forward to seeing innovative reference managers from smaller developers that finally support Pages. 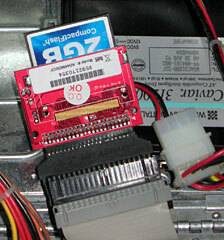 I have begun testing the Addonics CF adapter card using the PowerBook 190cs to start with. This Mac was given to me by a friend, so I thought it would serve as a good test machine, as I have no data to loose or financial loss to incur should anything go wrong. I had successfully performed the transplant, using the dual slot adapter, but the second card does not seem to show up for formatting, which is what I had suspected. The leaflet which comes in the box with the adapter states that there are some compatibility issues with the slave connection, and they recommend removable cards, which sounds rather strange. I suspect they may be referring to a Compact Flash adapter that allows other card types to be used in a CF slot. So far I can say that using the Dual CF adapter in a 190 is not going to work. It has been rather difficult to install a proper system on this machine, which only has a floppy drive and SCSI connection. I have been able to get the System 7.6 Disk Tools floppy system onto the machine and have it boot, but I have not had much success in getting the full System 7.6 installed. It seems the IDE-SCSI for docking does not work from a 680x0 Mac to a PowerPC Mac, my PB 1400, but it does work from one 680x0 to another, my father's LC 630. With the 630 I have been able to start an installation, but it seems to get stuck while writing the system file. I chose to use the universal install, seeing as I was using a different machine as the boot machine, and the other in docking mode. I will attempt to boot the 630 using the docked 190, so the 190 CF is the boot drive for 630, and try installing 7.6 that way instead, using the Disk Tools system as the initial boot system. Failing that, I may just use my 1400 to do the install and swap the whole thing back over to the 190, again using a universal install. I also purchased 2.5" to 3.5" inch drive adapters to later use CF or 2.5" drives in some desktop machines, I will report on them at a later time if you wish. I have the Addonics 2.5"-to-3.5" adapter as well. One of my "when I can find the time" goals is to install it in my Blue & White G3, which has a much faster IDE bus than the PB 1400, so I'll better be able to measure the difference between different Compact Flash card speeds. I haven't worked with a PB 190 in 7 years, but I don't know of any reason it shouldn't work with Compact Flash in an IDE adapter. It may be that the PC 190's IDE controller isn't designed to handle two drives, but that's just conjecture. Those old Macs can be wonderful writing machines with System 6 installed - anything later really bogs down the 8 MHz CPU. Yeah, it came with 7.1 on it, and it was a dog. I just downloaded 6 from the Apple website and installed it cleanly. Nifty. I was also given an unopened OS 8.1 retail box. I wanted to load that on one of my G3s, since I've read somewhere that it tends to be a little smoother running than 9.2. I was completely unable to get either machine to boot to the disk. I tried just about everything I knew including reformatting the hard drive. Still, the 8.1 disk seemed unbootable. I put in my OS 9.2 disk in, and it started right up with it. Oh well. Since your beige G3s have Apple serial ports, it should be possible to network your Classic to one of them using an ImageWriter II cable. Set up Internet Sharing, and your Classic could access the Internet, albeit slowly and with outdated browsers. I'll avoid the Internet completely, since I use my MBP for that. But the idea of using the serial ports might work. I'll see if I can find some anywhere. Thanks again for keeping up the great site. You are much appreciated! System 7.x was a bad match for the Mac Plus, SE, and Classic, although it worked nicely once you moved to a 16 MHz Mac, even one with a 68000 CPU (such as the Mac Portable, PowerBook 100, or my Brainstorm-upgraded Mac Plus). I have no idea why a beige G3 wouldn't boot into Mac OS 8.1, as these models shipped with Mac OS 8.0. I wanted to know if there is a way to upgrade eMacs here at school. Can we add a board to increase the speed of the CPU? I have upgraded CPU's in the past. But I have not seen anything out there for eMacs. I have several hundred 700 MHz machines still working fine. There are no CPU upgrades for the eMac as far as I know, but there are ways to overclock them. Leo Bodner's Upgrading Apple eMac tells how to overclock an 800 MHz as high as 1.33 GHz, but it requires soldering. There was another overclocking page by BigBadMac, but it's gone MIA. Just got this little gem from Google adwords (which I use for work). With Eric Schmidt [CEO of Google] joining the Apple board, you'd have thought that all Google services would be Safari/Mac friendly, well think again. "Please note that the AdWords Webinars will be held in cooperation with WebEx. Therefore, the sign-up process will be handled and any notification e-mails will be sent from WebEx. To access WebEx please use Internet Explorer since WebEx only runs smoothly with this browser." Okay, so Google don't own WebEx and can't dictate to them which browsers to support, in which case how about using a company that don't just support Billy G's Internet Nightmare. Unless of course WebEx also make antivirus software. Eric, this is not a good way to make friends in the Mac community. Membership on Apple's board doesn't seem to have anything to do with the company supporting the Mac platform. Chairman and former CEO of Intuit Millard Drexler has long been a board member, and there was a period of some years when Intuit stopped making QuickBooks for Mac users. I finally broke down and upgraded the technology in my classroom. I gave in and bought one of those 500 MHz iBook G3s from Wegener Media for only $140. Unfortunately, the iBook does not come with an AirPort Card. Looking around on eBay, I found some pretty good deals. Thanks to iFixit.com, I have been able to find the install instructions and shouldn't have any problems. While I have done all of the necessary updates on my new-used iBook, what I was wondering is, would I have to install any additional software to get the Airport Card to work with my iBook? I have read a few articles on LEM, but I wasn't sure if the card was simply "plug and play" or not. Any information that you might have on this would be greatly appreciated, as many of the cards for sale online don't come with instructions or a driver disk, if one is needed. Thanks again for everything that you guys do at LEM! Older versions of the Mac OS didn't include AirPort drivers because there were no AirPort Cards back then. That's why Apple provides AirPort drivers separately. If you're running Mac OS 9.x or any version of OS X, the drivers should already be in place making the card plug-and-play. You are right, with Google acting this way with computers it will be interesting to see the compatibility their cellphone OS will have. Anyone want to bet it will be much more compatible with Windoze machines? At least we have Yahoo, who have said that they will be trying to support everyone. Good on 'em.